Tim Federowicz is the backup catcher again; Justin Sellers optioned to Triple-A Albuquerque. Tim Federowicz posted a 1.643 OPS after being demoted to Triple-A Albuquerque. Tim Federowicz returned to Dodger Stadium on Wednesday. In his mind, and on the depth chart, it was like he never left. Dodgers manager Don Mattingly said that Federowicz will be the team’s number-two catcher, supplanting veteran Ramon Hernandez, whose 0 for 4 performance against the Arizona Diamondbacks on Tuesday lowered his batting average to .045. 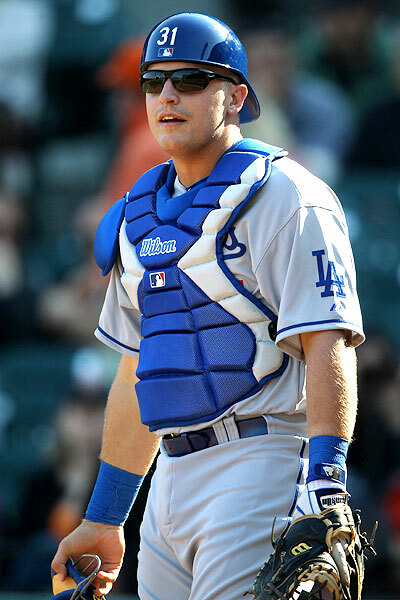 Hernandez, who was obtained from Colorado for pitcher Aaron Harang on April 6, is staying on as the Dodgers’ third catcher. “I’ve got plenty of infielders and … you look at it more like a little bit better hitting bench,” manager Don Mattingly said. “We’ve played A.J. (Ellis) a lot to this point. Most of that is because the number of off-days, we’re able to keep him fresh, but we’re starting to run out of those. He’s going to have to get his days off. When you have the third guy, it allows you to use him as a pinch-hitter. That allows you to do more with those guys. Federowicz was putting up video-game like numbers with Triple-A Albuquerque: a .531/.561/1.082 slash line that translated to a 1.643 OPS. He had seven home runs and 20 RBIs in 13 games, leaving the Dodgers with little choice but to bring him back with Hernandez — and the entire bench — struggling at the plate. Asked who his number-two catcher was, Mattingly said that “Fed’s pretty much, all along he’s been that guy.” It just didn’t look like it when Federowicz was in Albuquerque and Hernandez was in Los Angeles. Now that he’s here, Federowicz gives the Dodgers a pinch-hitter with power-hitting potential, something they didn’t have with Hernandez, Justin Sellers (three home runs in 265 career plate appearances), Skip Schumaker (23 HRs in 2,750 PAs), Elian Herrera (one HR in 214 PAs) or Luis Cruz (6 HRs in 535 PAs). While Federowicz and Ellis are strictly catchers, Hernandez can also back up at first base. That might be the position that allows him to get the most at-bats with Jerry Hairston Jr. on the disabled list and Adrian Gonzalez battling through a strained trapezius muscle. This entry was posted in JP on the Dodgers, On The Farm and tagged A.J. Ellis, Adrian Gonzalez, Albuquerque, Jerry Hairston Jr., Justin Sellers, Ramon Hernandez, Tim Federowicz by J.P. Hoornstra. Bookmark the permalink.